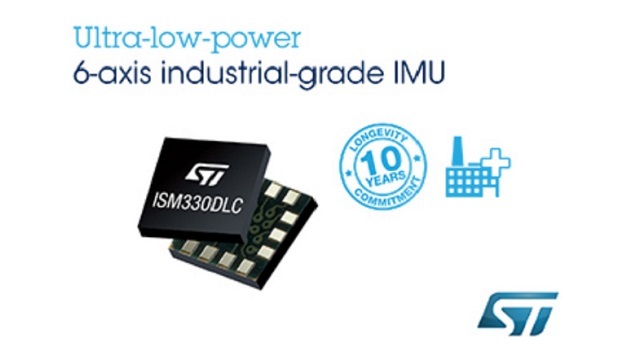 Containing a 3-axis accelerometer and a 3-axis gyroscope with user-selectable full-scale up to ±16g and ±2000dps respectively, the ISM330DLC provides high measurement resolution and smart energy-saving features to enable long-lasting battery-powered industrial devices. Ideal for applications such as industrial IoT systems, robots, drones, platform stabilizers, and telematics, its wide accelerometer bandwidth up to 3kHz also allows use in vibration-monitoring and compensation systems. The ISM330DLC consumes just 0.5mA in normal combination mode and 0.75mA in high-performance mode. In addition, with a large integrated FIFO that lets the host system retrieve data efficiently, as well as smart features and interrupts including tilt detection, free-fall, wakeup, 6D/4D orientation, click, and double-click, the ISM330DLC enables power-conscious application design to achieve additional energy savings. There is also a sensor-hub feature for efficiently collecting data from additional external sensors. Extensive industrial-grade design features are built-in, including a dedicated configurable low-latency signal-processing path, low noise, and filtering optimized to ensure closed-loop control stability. The signal path can be independently configured to make gyroscope or accelerometer data available through an auxiliary SPI interface.